As the title states, this is the ultimate Chicago illustration. 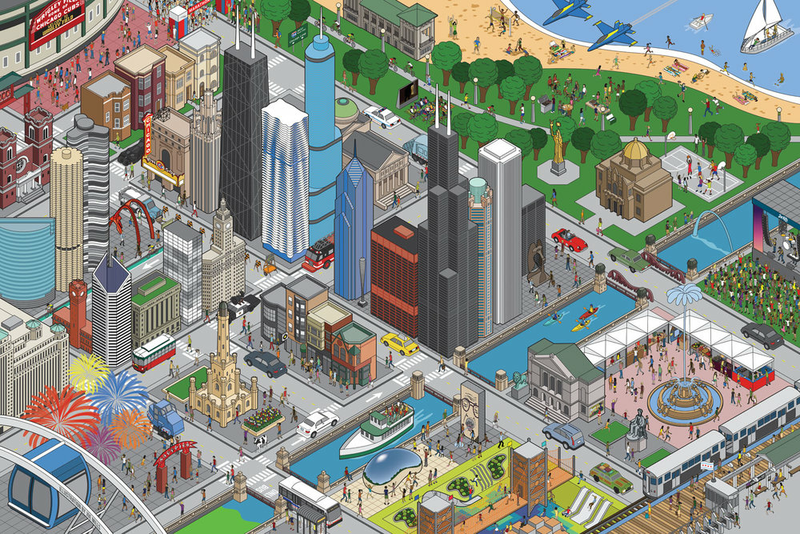 All the major landmarks, buildings and icons of Chicago all in one large scale isometric cityscape. Click here to purchase a 24″ x 36″ poster of this illustration for $15.00. I didn’t know it at the time, but it really jump started my entire line of Chicago prints that I have now. Considering what I set out to do, I accomplished all of my goals with this poster. And to this day, it remains one of my favorite pieces. However, I hadn’t pushed it as far as I knew I could take it. My skills and confidence weren’t all the way there yet. I had 500 of them printed. And I knew that when I sold out of them, it was time to start Ultimate Chicago. In the summer of 2015, I sold out. Thankfully, my confidence level and my skills had reached the right point to get the ball rolling. 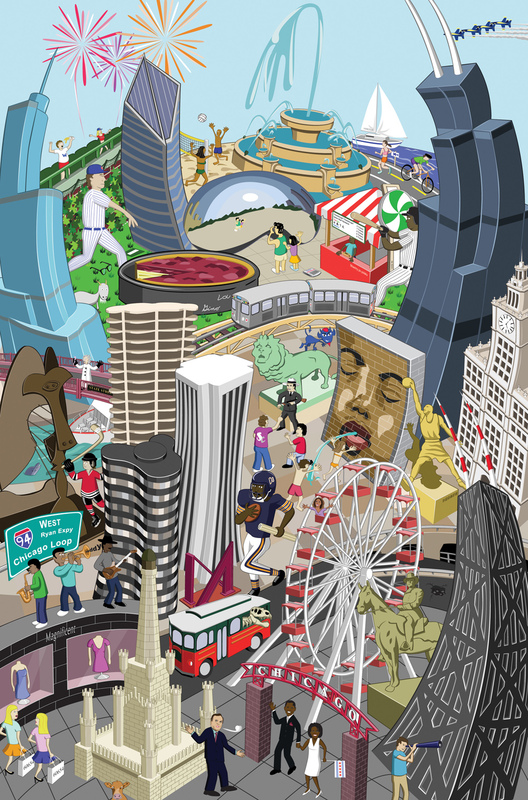 With Ultimate Chicago, I challenged myself to fit in as many Chicago landmarks and icons as I could into one 24″ x 36″ poster. While I never set out to make it as eccentric as the eBoy cities, I did want to make it as densely packed. I started with all the buildings since I considered that to be the focal point. From there, it was time to put in all the people. I had originally wanted to include as many possible references to Chicago in this poster. For instance, I wanted to include both Daley mayors, Oprah and Jordan just to name a few. 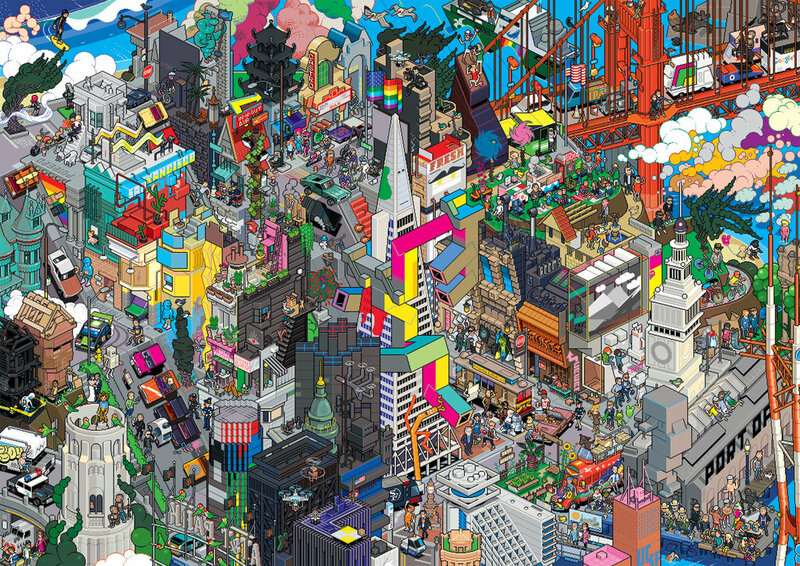 In the end, though, I liked that the illustration had a major focus on the buildings, icons and landmarks. In turn, I just used the people as a way to populate the space.